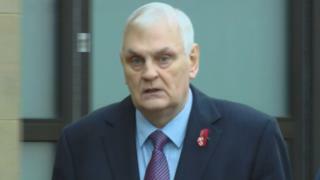 Celtic Boys Club founder Jim Torbett has been jailed for six years after being convicted of sexually abusing three boys over an eight-year period. The judge told Torbett that Celtic Boys Club had given opportunities to hundreds of aspiring young footballers. But he added: "You used the club as a front for child sexual abuse." There were tears in the public gallery as the verdict was announced, and emotional scenes in the foyer of the court as those affected by the case embraced each other. 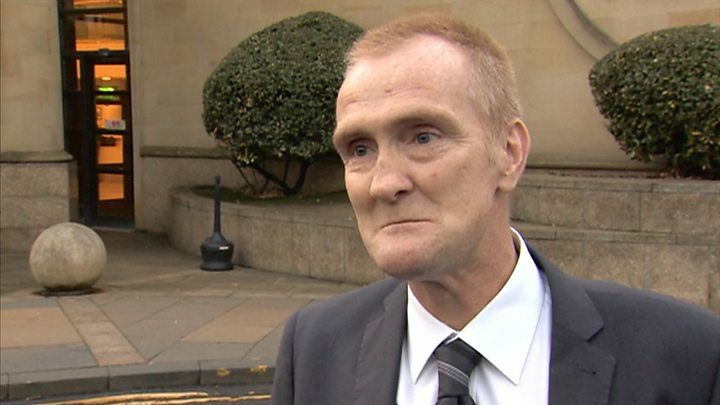 Torbett, of Kelvindale, Glasgow, was found guilty of five abuse charges between August 1986 and August 1994. Torbett had previously been jailed for two years in 1998 for abusing three young Celtic Boys Club players between 1967 and 1974. He had been living in California when the further allegations of abuse came to light. Victim, Kenny Campbell, broke his silence in a BBC documentary, Football Abuse: The Ugly Side of the Beautiful Game. A month after the documentary was broadcast, the BBC tracked Torbett down to California and put the claims to him in a dramatic confrontation. Within hours of that footage being broadcast, Torbett was escorted to the airport by US Homeland Security and he was arrested on his return to Scotland. During the trial, Mr Campbell told jurors how he played for Celtic Boys Club when he was 14. He said Torbett - who was also the manager - had been his "hero" and that he would have "run through walls for him". However, he said Torbett then went on to abuse him, including one attack while on a Celtic Boys Club trip to Noyon in France. A second victim, Andrew Gray, died last year following a swimming pool accident in Australia. However, statements he gave to police before his death were read out during the trial. The 41-year-old had told officers he was first abused by Torbett after training, and that he had not known what was happening. He told police: "I can still remember lying in bed that night thinking: 'Is that how adults act?'." Mr Gray said he was also attacked in Torbett's Glasgow flat, and that he would be dropped from the team if he did not agree to his demands. The final victim, now aged 35, told the trial how he was abused at the Trophy Centre business which Torbett ran in the Pollokshaws area of Glasgow. He said he was attacked while on his own with Torbett. Torbett had branded the victims "liars" and said allegations were like "something out of fairytales". Media captionKenny Campbell says speaking up about the abuse was worth it: "He can't hurt anybody else for a long time"
Outside the High Court, Mr Campbell described the verdict as "unbelievable". Asked how he felt, he said: "Ecstatic. Relieved. Vindicated." Mr Campbell said he was grateful to BBC journalists Mark Daly and Calum McKay for investigating Torbett. He added: "The worst thing about being an abuse victim, a survivor, or whatever you want to call them, is the fear of not being believed. "Even right up to the verdict was announced I had the fear that I would not be believed." Mr Campbell, who has four grandsons, added: "I'll walk away a proud man. "I'll know I've made a difference and I'll know it has been worthwhile. "If I can save one person, or one child, from what I went through then it is worthwhile." Mr Gray's sister, Michelle, described the moment the verdict was announced as "extremely emotional". 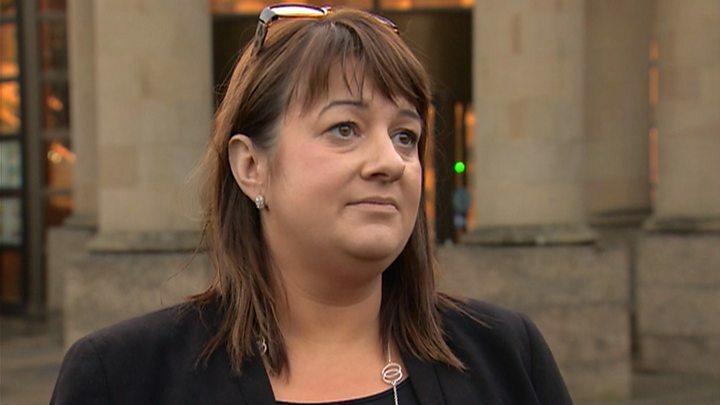 She added: "The last two weeks have been sheer hell and myself, my mum, my brother and Andrew's friends will be haunted by what we learned that Andrew suffered at the hands of Mr Torbett." She added: "The man that was convicted today destroyed his life. There is no doubt about that." Ms Gray recalled a conversation with her brother before he died. She said: "Andrew asked me in Australia, if he didn't make it, would I do all I could to get justice, not just for him but for all the other boys. "And that has been the reason why we have fought through the last 13 months." She added: "Now our beloved Andrew can finally rest in peace." Det Ch Insp Sarah Taylor, of the National Child Abuse Investigation Unit, said: "Torbett was a predator who used football to allow him access to young boys. "These were boys who had a dream, they wanted to play professional football. Torbett was a man in a position of trust but he betrayed that trust. "He preyed on these boys, he exploited their dreams and he subjected them to callous and depraved abuse. "I have no doubt that he exerted control over the boys in his care and coerced them with promises and lies." Det Chief Insp Taylor praised the courage of the victims who helped bring Torbett to justice. She added: "Reporting these offences and reliving the experience can be traumatic. "We understand this and we will do everything in our power to bring investigations to the appropriate outcome."